Maximo Blanco has issued an apology after being DQ'd at the TUF Finale. 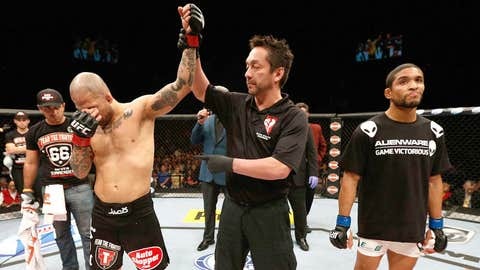 UFC featherweight Maximo Blanco came storming out of the gates in his fight against Akira Corassani on Saturday night, scoring with early strikes and a takedown that have become a signature of some of his best performances. Unfortunately another part of Blanco’s past came back to haunt him seconds later when he unloaded a huge knee strike that blasted Corassani in the face, sending him slumped over in a heap on the mat. Now normally a strike like that to end the fight would be met with celebration, but in this case Blanco threw and connected with the knee while Corassani was still down on the ground, which is an illegal move. Once Corassani revealed to the ringside doctor and referee that he could not see straight and was obviously rattled from the blow, the fight was stopped and Blanco was disqualified for the illegal move. On Sunday, Blanco spoke to FOX Sports to explain his side of the story and explain why he threw the knee that ultimately led to the end of the fight. "I remember landing two or three punches, and took him down. Then, I think I thought about throwing a left kick to the leg for a moment, but stopped, then, just a moment later, when I thought Akira was up, I unleashed a knee instead. I was only thinking about finishing the fight early," Blanco explained. No more back flip for me. Unless I am told okay by my manager after the fight…I am shamed about that back flip. When the referee came over and explained to Blanco that he had been disqualified for the illegal strike, the Venezuelan native jumped and did a back flip in the Octagon as if he was celebrating the moment. As it turns out, Blanco had no idea what the referee said to him because he doesn’t speak English and it wasn’t until his manager was able to get inside the Octagon to explain to him what happened that he understood the ramifications of the moment. "At that point, I honestly didn’t realize the knee I threw was illegal. I actually didn’t know why the fight was stopped. I don’t understand English so I didn’t really quite understand what referee told me at the neutral corner. I am not making any excuse here but when adrenaline is pumping its hard to understand the language I am not familiar with," Blanco said. "So when he waved off the fight, I actually thought I won by a doctor stoppage. Then, my manager came to me told me I am disqualified." "No more back flip for me. Unless I am told okay by my manager after the fight. I promised this to Sean Shelby as well. I am shamed about that back flip." Once he was aware of what happened, Blanco says he went over to Corassani and apologized about the infraction. It was never his intention to land an illegal strike, and he conveyed that to his opponent in quick order once the fight was stopped. "I felt shamed. So I went over to apologize to Akira, and he asked me "What happened?" in Spanish and I could only say, I am sorry, that knee wasn’t unintentional but it was illegal so I am the one who needs to take the blame here," Blanco said. The only thing I can say is I am very sorry. The fans, UFC, Akira, and everyone, they all deserve better. I will promise that this will never ever happen again. Corassani stated in his post fight interview that while he doesn’t blame Blanco for the illegal knee, he also knows that this is a pattern with the former Sengoku and Strikeforce fighter. Blanco has previously been disqualified for illegal strikes, most notably in 2009 when he threw and landed a soccer kick to Akihiko Mori that forced their fight to be stopped as well. The illegal blow shattered Corassani’s nose in five places, as well as concussing the Ultimate Fighter alumnist. Blanco didn’t want to respond to Corassani’s claims about his past, but he did want to issue a public apology for the incident. He takes responsibility for the knee and hopes to move forward with his career after a disappointing end to the night at the TUF 18 finale. "I actually wanted to apologize to Akira again in the dressing room but by the time I went over to his dressing room he was gone. So I would like to say here again, Akira, I am very sorry about what happened," Blanco said. "The only thing I can say is I am very sorry. The fans, UFC, Akira, and everyone, they all deserve better. I will promise that this will never ever happen again."